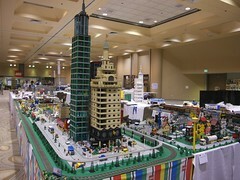 The Bricks by the Bay 2013 convention is almost here! I’m so excited – and busy! If you haven’t registered for the convention yet, please note that we are in our final week of registration. The deadline is this coming Friday at midnight. After that, no badges will be sold! There is no walk-up registration. All our attendees will have custom printed badges made of LEGO bricks and we are doing the final preparations and packaging of the badges and attendee goodies this weekend (let me know if you want to come help out). Badges are currently selling for $70 each and there are 57 (out of 500) remaining as of this writing. Register today! See the schedule of events for more information about what is going on at the convention. If you’re not coming to the convention please come to our Public Exhibition, Sunday August 11. Tickets are on sale now for $8 per person (ages 2 and under free). Buy tickets today. Thank you and hope to see you at the convention or exhibition!